Heather, I’m glad we could invent such a word together. Maybe in our upcoming presentation at SACSMC, we could say we coined this phrase (or maybe not). 🙂 Thanks Heather. I appreciate the constant humor and support. Your point brings up the importance and relevance of being intentionally neighborly and helping those that cannot help themselves. It’s always important to ask why a lawn is not mowed. There is often a story behind that and sometimes some pretty intense sociological issues too (reasons for blight). Mowing someone else’s lawn is a very practical thing to do and can be such a huge help to someone if that person is truly unable. Or helping someone find the resources to get a lawn mowed is also equally as good (borrow a mower from you every week, find a gardener, teach lawn care skills, etc…). On a related note, without commenting to toot my own horn, one of the proudest moments of the week is when my boys take out the garbage for our 88-year old neighbor. She literally cannot do this by herself, so it’s important for my household to do this for her. What a joy it is to help in this very small way, and I hope my boys will remember that I made them do this. They may complain right now, but I hope someday they’ll in turn do the same with their own kids. Very well said, Heather. I think when a lawn is out of control in a situation like that, it’s really an example of how our society has failed to embrace the concept of community. We do not live on parcel islands. What we do on our parcels matters and makes a difference to those around us. In situations like this the neighbor has a responsibility to the rest of the community. While we don’t need to be lawn police, it really does matter for the ethos of the community and even property values. Thanks Heather. I appreciate your parent kudos. We are just learning, enjoying the journey on most days and failing forward. That’s all we can do. What a neat story about your Mom. Ryan…..I must know….is the picture from your youth? Also I love the term “Parcel Mullet” and will work it into my repertoire! Ray, I have never actually sported a mullet, though in truth I wish the photo above was me when I was younger. It would be great to have such a classic mullet picture. Thanks Ray. AWESOME! post Ryan. I like how you can take simple situations and make relevant posts about them. Keep it up. Thanks Tom. I really appreciate that. Ha ha. Thanks Jeff. I’m still laughing over the word. It’s the small things in life and I’m getting such a kick out of it. Hey, I need to come see your band play ones of these days. What a great laugh today, super way to start out a morning! You are so creative, keep up these entertaining blogs! How is your wife’s book coming along? Wasn’t she going to be distributed soon in bookstores? I’m glad you’re entertained. Thanks so much. Yes, her book came out and is currently in Barnes & Noble as well as the school system through Scholastic books. I imagine other bookstores are carrying her book too. It’s for sale on Amazon and many other places online too. For anyone intersted, check out her site at http://www.jennylundquist.com. The book has had some great reviews too, which is wonderful. It’s been a fun few weeks. She actually did a book signing in Carpenteria last week and she is doing one in Berkeley soon as well as Seattle. Good times. I love it – parcel mullet is going straight into my UAD definitions list addendum. Hilarious! I love this! 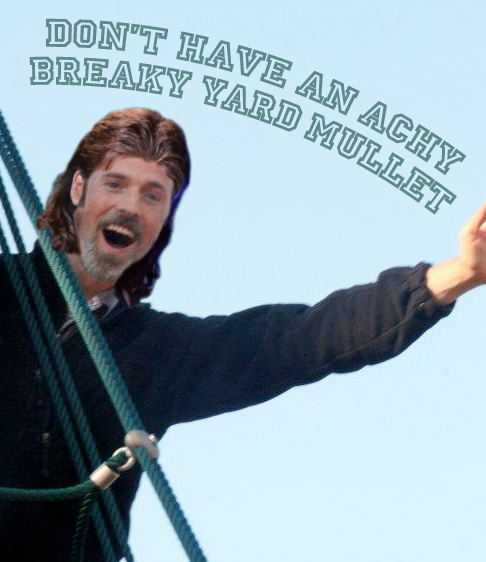 Just in case anyone is still rocking a mullet it is absolutely awful – you gotta change. I used to live close to Carpenteria. Thanks Nicole. I don’t disagree with you at all. 🙂 I checked out your website. It looks like you traded coasts. Hilarious! I love this. This is a fantastic post. If you enjoy things Mullet, there’s a souvenier shop in Nevada City that sells refrigerator magnets with different mullet styles, as well as Pontiac Firebird magnets. No, I won’t send you one.